Beast of prey. Following the extremely successful V 15 Nitro, Acer presents its next gaming platform. Instead of an upper mid-range GPU, a genuine premium model is in the Predator 15. Can the GTX 980M stand up against the 15-inch competition? Positive: Great performance; very good quality; low temperatures; comfortable keyboard; good sound quality; additional cooling module; competitive price (in this segment). Negative: Dimensions and weight; weak display. Positive: High performance; quiet cooling; perfect mechanical processing; long battery life. Negative: acklit numeric keypad can not switch from blue to another color; audio out softly crackles. 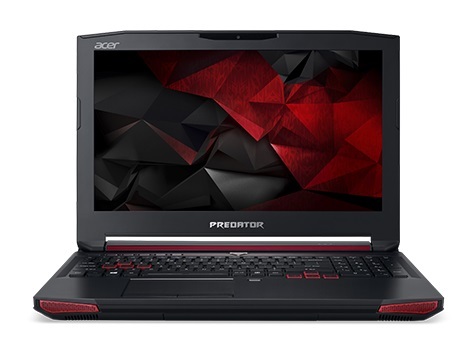 Model: The Acer Predator 15 G9-591-74ZV is an aggressive looking gaming laptop and is packed with high performance parts. This gaming laptop is heavy at 3.6 kg and 39 mm high. The thick profile is needed to accommodate the precisely designed cooling exhaust vents as this laptop produces much heat, when it is used for heavy gaming. The Windows 10 system features an Intel Core i7-6700HQ quad core processor at 2.60 GHz, 32 GB of DDR4 RAM, and the high-end Nvidia Geforce GTX 980M with 4 GB of VRAM. As a result, the gaming performance is great. The 15.6 inch Active Matrix TFT Color LCD with LED backlight features Full-HD resolution and uses IPS technology. A 1 TB HDD coupled with a 512 GB SSD provides enough space for modern gaming. The keyboard features a backlight and a number pad. The laptop also provides a webcam with microphone, one HDMI port, four USB 3.0 ports, an SD card slot, and a Thunderbolts 3 port. The 8-cell lithium-ion battery with 6000 mAh lasts up to 5 hours of gaming according to Acer. There is a blu-ray writer, which can be replaced by the included Predator Frostcore Fan if extra cooling is preferred. 84.88%: This rating should be considered to be average. This is because the proportion of notebooks which have a higher rating is approximately equal to the proportion which have a lower rating.